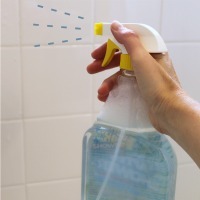 One of the clever bathroom cleaning products that I’ve really grown to like over the years are the daily shower cleaner sprays. After you shower you simply mist some of the spray around on the shower walls and it helps to keep your shower clean with less mold or mineral buildup in between more thorough cleanings. I started out with the name brands like Tilex. . .
then used the store brand . . .
then bought the dollar store stuff . . .
and now – I finally know how to make my own! My homemade daily shower cleaner spray is actually doing an even better job than the store bought stuff was and that’s because the homemade version includes a dishwasher rinse aid product in the recipe. This has done an awesome job of leaving the shower surfaces cleaner and smoother after a shower. When it’s cleaning day, I just give my shower tile a little scrubbing with my homemade lemon soft scrub and it looks great. No heavy duty scrubbing is needed because the daily spray keeps things from getting too bad during the week. In one of my previous posts about how to clean a shower head I shared that I also have some annoying glass block windows in one of my showers. Those glass block windows get covered in water spots – and they are soooo hard to clean off. I was super happy when I discovered that vinegar worked really great on the water spots. 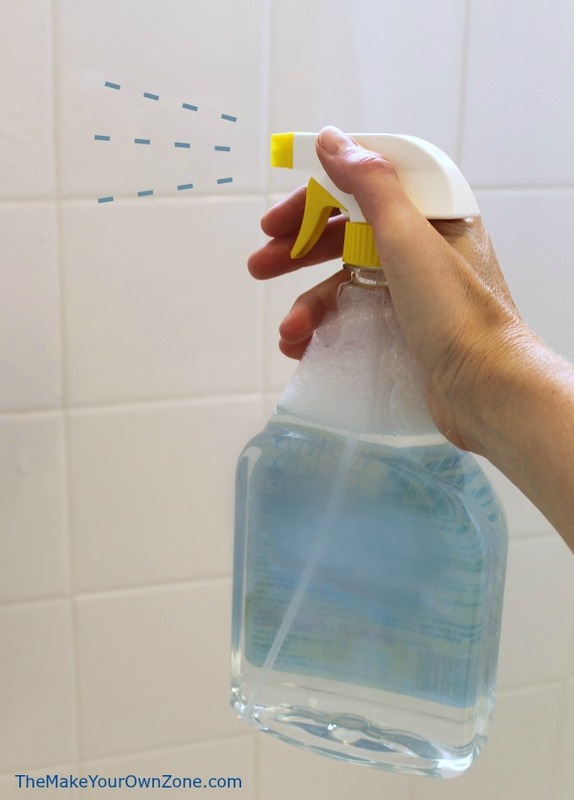 This homemade daily shower cleaner spray keeps the water spots from ever forming on the glass windows in the first place! Oh happy day! Those windows finally look cleaner than they ever have before. I’m sure it’s the rinse aid in the mix that’s working the magic. 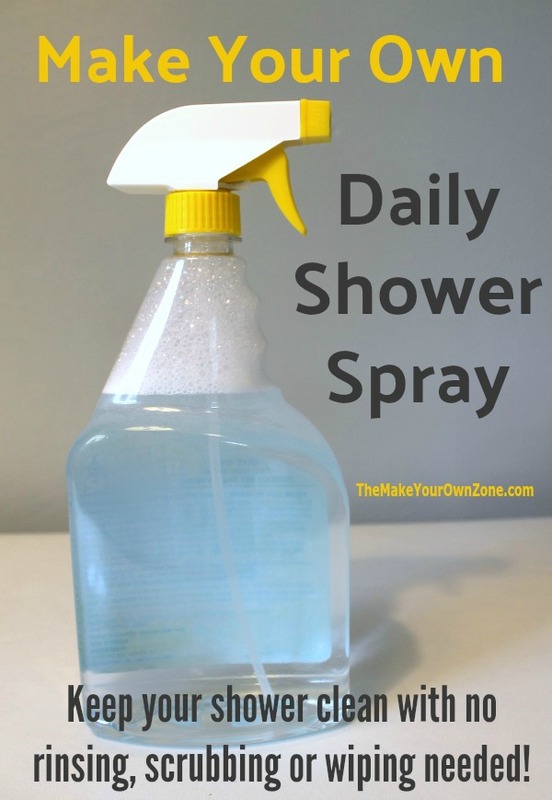 If you’re a person that likes to use the daily shower sprays, I think you’ll really love this shower cleaner recipe too. I don’t think I’ll ever go back to the store bought stuff again. It really is that good. My recipe makes a 32 oz batch, which is the same size as the commercial brands of daily shower cleaner sprays that are being sold. Just save the bottle from a store bought brand once you’ve used it up, and simply refill it with your own homemade version. To make my DIY version, I begin by pouring a ½ cup hydrogen peroxide, ½ cup rubbing alcohol, 1 teaspoon of dish soap and 1 tablespoon of rinse aid (like Finish Jet Dry) into a spray bottle of at least a 32 oz size. I always use my funnel to make things easier! Next, slowly add 3 cups of water (the mixture might bubble a little bit because of the dish soap). If you are re-using a 32 oz bottle from a store bought daily shower cleaner spray, you really don’t even need to measure for this step . . . simply top off the bottle with water. 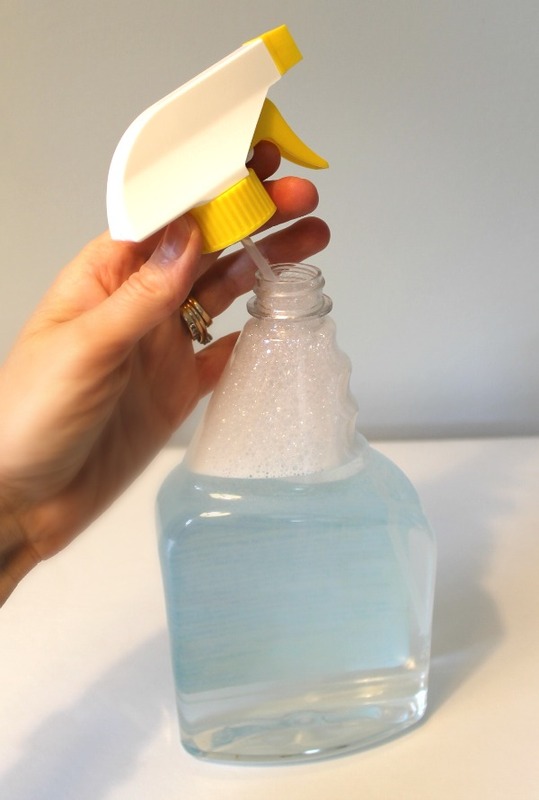 Put the top back on the spray bottle and then slowly tip the bottle back and forth to mix the ingredients. To use: After showering, mist the spray on the walls of the shower and you’re done. There’s no need to wipe. Save money and make your own homemade daily shower spray. This DIY homemade version will help keep your shower clean with no scrubbing or wiping needed! Begin by pouring the hydrogen peroxide, rubbing alcohol, liquid dish soap, and the dishwasher rinse aid into a spray bottle of at least a 32 oz size. A funnel is very helpful for this step. Next, slowly add the 3 cups of water (the mixture might bubble a little bit because of the dish soap). If you are re-using a 32 oz bottle from a store bought daily shower cleaner spray, you really don't even need to measure for this step . . . simply top off the bottle with water. To use: After showering, mist the spray on the walls of the shower and you're done. There's no need to wipe. Update #2: I’ve been asked by readers if they should be concerned if there is overspray that lands on the bottles of shampoo, or the shower curtain, etc. I’ve been spraying this around my shower for several years and I’m sure I’ve hit some of the other stuff too, but I have never seen any problem so I think it’s OK to spray away! An additional thing to be mindful of is that hydrogen peroxide can slowly break down in the light. That’s why hydrogen peroxide is always sold in those dark brown bottles. If possible, keep this mixture in a cupboard or some other place where it will be dark to keep the hydrogen peroxide at optimum performance. A couple other ideas are to use a dark bottle, or to just add a little more peroxide from time to time. One reader told me she just put a sock over the bottle. You might also see that this mixture is a light color when you first mix it (because of the rinse aid or colored dish soap that may have been used) but over time the mixture seems to look more clear. Once again, I think it’s the peroxide in the mixture that causes the colors to slowly fade away. Hi – just sprayed this on my glass shower walls – but it is leaving marks – should I be rinsing it off. You usually do not rinse the spray off and it’s the rinse aid in the mixture that helps leave it streak free. Perhaps try increasing the rinse aid in the mixture if you are having this problem. Love it — have been making my own for quite a while. I also feel that using body wash in the shower is better than bar soap, which seems to always leave a film!! Can you use this on cultured marble? May I add essential oils like peppermint or orange? Will it effect the results? Yes, you can add some essential oils and it should not effect the final cleaning results. I have used this receipt for years. It works great. No issues with tile fiberglass. It really shines up fixtures. Is this safe to use on tile? Yes, I use this all the time on the ceramic tile in my shower and in fact this spray is ideal for keeping your tile clean. I have a shower door with stainless steel (i’m pretty sure it’s stainless and not just chrome). Is this spray safe to use on the stainless or if sprayed and left on will it cause discoloring? Anyone try this before? We LOVE this spray!! Have been using it in our new home since March. I add Lemon Tea Tree oil to the mix. Smells amazing!! Glad to find this recipe. The ones with Vinegar smelled terrible (no amount of essential oils helped!). And I feel like this works better! I consider rubbing alcohol and isopropyl alcohol to be the same thing. This solution is AMAZING! We updated our bathroom in dark tile and glass show wall. We quickly learned how much trouble soap scum was. After trying other solutions I found this and have been so thankful. It is very effective at keeping soap scum from the tile and glass. 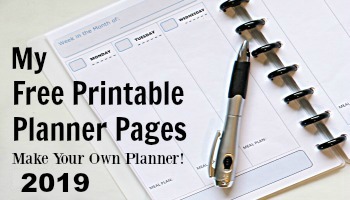 It’s quick and easy to make, costs almost nothing, and best of all works! I cheated (kind of). I have one of those shower sprayers that automatically spray when you get out of the tub. I drilled a hole in the top of the bottle and poured this mixture in it. Cheaper than buying the new bottles of liquid. I only made a small batch to test. Didn’t know about keeping in a dark bottle. Will try covering the bottle. I keep the solution under the sink cabinet which should be pretty dark. Jury still out, but I hope the solution works as well as everyone says. On my second batch! This mix is both marvelous and amazing. There is NO scrubbing, stainless faucets dry spot free. You must start with a clean shower but thereafter it is just a mater of remembering to spray your homemade mix! My shower and tub look like new! Never before has it looked so good, and all I do is lightly spray, and I don’t even have to do that every day. Amazing! I think you could certainly add some more jet dry to the homemade shower mixture and see if that makes a difference on the glass shower door. I haven’t noticed streaking when I use this mixture, but my shower is mostly tile, with glass block windows so slightly different surfaces I guess. Another thing might be to try a little more alcohol as that aids in faster evaporation. I tried to scroll thru most of the comments but is it ok to add a few drops of essential oils (any, like lemon, lavender, peppermint, maybe OnGuard or something) for a touch of scent? Yes, it is OK to add a few drops of essential oil if you wish for a little added scent. I use the old peroxide bottle and a sprayer from another bottle. Works perfect!! I saw that you were using the window cleaner on the outside of your windows. Can it be used inside too? Yes! I have used it several times indoors too with good results. I have just joined the DIY cleaner club and am very excited at the prodpect. i have a suggestion that can be used for any mixture containing hydrogen peroxide (H2O2). I keep a small spray bottle of 30% H2O2 (the concentration sold commercially as a first aid product) to prevent or treat disease when i repot orchids. i find it convenient to protect the bottle from light exposure by simply wrapping the bottle with a layer of aluminum foil. A single sheet of foil is completely opaque. This approach would mean you could keep using your socks on your feet! (fyi most socks are made from knitted fibers which will allow some light to pass through). I agree, this recipe is definitely a keeper. I have used it for years too! This works great! thanks for the post, it has done a great job of helping me keep my tub clean between regular cleanings. I added a half teaspoon of tea tree oil to mine but followed the rest of your posted instructions. I’ve finished using my first bottle, it lasted a long time too. I made a batch recently with just with water, the rinse aid, and a tablespoon of eucalyptus oil. It’s working great. BTW – I learned a while back that switching to liquid body wash instead of bar soap eliminates a great deal of soap scum. That sounds like an interesting recipe Steve. And I agree – I think there is less soap scum build up with body washes too (as opposed to bar soap). Usually the things to be most concerned about on stone are acidic substances like vinegar or lemon juice. 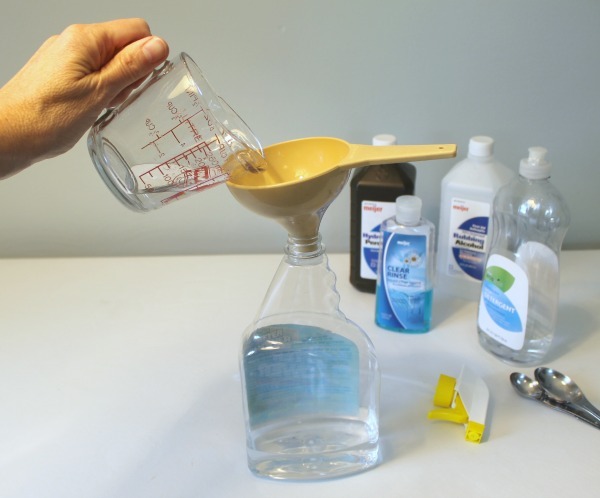 This mixture does not have either of those ingredients and instead has rubbing alcohol and peroxide, which are safe to use on stones like granite or quartz. So I have never tried this personally on stone, but my inclination would be that it should be OK, based on the fact that it does not have any acidic ingredients. Does this spray work well on iron stains? We have well water issues and lots of iron and rust. I am not sure on that Angie. I think it might help to some degree, but I don’t know if it can stop iron or rust problems completely. Found this today, I’ve scrubbed my shower & tub out and sprayed for the first time as of ten minutes ago! Definitely looking forward to less water spots and other nasty buildups. Used one of the suggestions from the comments to keep it in a black-sock-wrapped bottle, wish I’d have though of that when I was making perfume years ago. Thank you for sharing this—I added lemon essence to make the bathroom smell nice, and now my SO might be able to be in the bathroom after I clean, what with there being no heavy chemical or bleach scent! Thank you so much for the recipe for the shower spray! I’m tired of paying way too much for the store bought brands ! Some family members use the spray pretty liberally. They spray painted walls and ceiling, shower curtain and rod, even the bath products like soap and brushes or loofahs. Is this recipe safe for those surfaces and products? I don’t think there should be any problem with the spray hitting some of those areas too. Some of my spray goes over onto soap bottles, etc. too and I have never seen any bad effects. At least they’re happy to use the spray I guess! I took a black sock and placed the bottle inside to keep it dark. Excellent idea Donna! A great resourceful solution to the dark bottle problem. Buy a large bottle of peroxide. When you use the last of the peroxide, save the bottle and just drop in a sprayer from an old spray bottle. This way you have a dark bottle and the peroxide will be protected. I am assuming this can be used on tile showers also. I recently have started using all natural cleaning products so really looking forward to trying this. I have the foe or fake marble shower walls. Does anyone know if this will bother this stuff? I’m now using the store bought stuff and have for several years now…I’m thinking if the store bought stuff has not bothered it yours should be ok too!!!????? The best tip I’ve ever found to keep the shower free of soap scum is to not use soap. Bear with me. As you might imagine, the cause of soap scum is soap. As soap scum builds up, it becomes a breeding place for mold and bacteria. Rather than cleaning soap scum, prevent it from forming in the first place by using body wash. Like shampoo, body wash is a form of mild detergent. It is not soap, and it does not form soap scum. So, clean your shower, then stop using soap. Use body wash instead, and you will find that the soap scum does not come back. Pete this is exactly where I ende up. Not only is there no soap scum but it is way better for your skin, body wash doesn’t dry out your skin – bonus is less money on body lotion! I have always used only body wash, but still get mold in the corners of my tile and glass shower. So, that isn’t a sure deterrent against mold buildup. I’ll try this mixture and see if that can prevent it. Yup, always use body wash and still get mold in corners. Hi! I was concerned that the peroxide or some of the other ingredients migh affect the grout, silicone sealant in the shower. We live in an apartment and can’t very well replace anything that’s damaged. I leave for work before my husband and he does not have time to spray the shower before he leaves. My question is, 1. can I spray after my shower (before his) and it still be effective? (and safe – not slippery) or 2. can I spray the shower later that evening and it still be effective? Hmmm, that’s kind of a tough one Leslie. I think out of those two choices, I would spray in the morning after your shower and hope you still get some benefit after his shower too. It should not make the floor slippery. I think if you spray it later in the evening, it won’t give you the same benefits. Thank you for your reply! I’ll give it a try and see how it goes. To clarify, is that ethyl rubbing alcohol or isopopryl rubbing alcohol? It is the isopropyl rubbing alcohol. What is the percent of the alcohol that is used? 50% 75% 91%? I know the stronger is usually used medically, for sterilization. Does it matter? I use the 70% isopropyl alcohol, which is the one most often found at drug stores and grocery stores. If you have the 90% alcohol, I think I would use a little less (maybe just a 1/3 cup or 1/4 cup) and use a little more water. Hi, I’ve been seeing similar recipes online. Nearly all of the recipes contain peroxide. while I know that peroxide is a good disinfectant and helps prevent mold and mildew from forming it has a very short shelf life, about 30 days, shorter if exposed to sunlight. I use peroxide to clean my kitchen, bathroom and laundry. Also, I keep it separate in its dark opaque bottle until i’m ready to use it. However, once it’s mixed with something the other ingredients act like a catalyst and cause a chemical reaction. It’s the chemical reaction that make it so effective but it’s my understanding that after a couple of hours(? ), days(?) it becomes useless. Which is why I hesitate to premix peroxide with other ingredients. Huge money saving tip! I have never made my own version but will start after reading your post. BUT, I do use the store bought versions and soak my razors in them between uses and it keeps my blades razor sharp FOREVER. Obviously it keeps the mineral deposits which dull the blades off them the same way it keeps a shower clean. Just remember to rinse well before use and shave away. You know how much razors cost, this will save you a bundle. You could buy the Dawn foaming soap, pour out most of the detergent into another container. Fill up the foamer with water. You’ll start saving right away. When all the full strength Dawn is gone, replace it with whatever D.L. you like and keep on saving. This sounds great, thanks for sharing. I have the “automatic” rinse machine (scrubbingBubble brand). Do you think this will work in that system? I mean, i can only shake the solution once, then stick it in the machine. After that, I won’t be able to shake it anymore. Thanks. In these types of situations, I usually feel it’s worth a try. I think if you weren’t satisfied with how it worked in your automatic rinse machine, you could empty it back out and all you would have lost are the ingredients you used (which aren’t that costly of ingredients). Really interesting cleaning recipe! 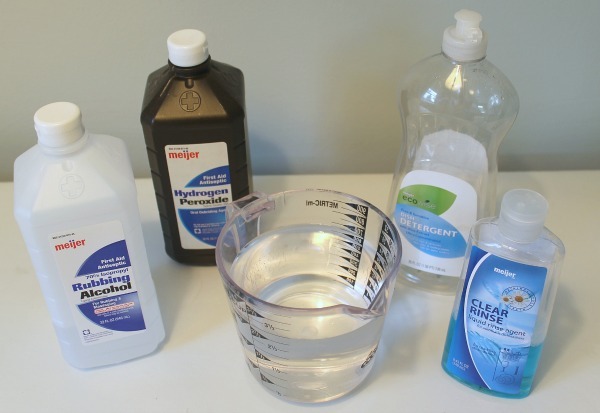 I also don’t use Hydrogen peroxide as a cleaner and I am curious to try it! Thanks for sharing! Would like to try the shower spray, but how will it affect the shiny chrome? I have not had any problems using this around my chrome faucets in my tub area, but I guess it’s also true that I spray this on the tile walls and not directly on the faucet. Nevertheless I’m sure my tub faucet has gotten some of the “overspray” and the chrome looks fine. I just tried this and sprayed directly on the chrome. Worked beautifully! The water here where I just moved to leaves water spots after just one shower, so this is great! I don’t have a dishwasher, and I hate drying dishes, so I’m going to start adding a few drops of rinse aid to the rinse water. I expect it should really help! Thanks For sharing. I bought and used the green alcohol. My husband loves the spearmint scent. Interesting idea to use the green alcohol! I have very hard water and my shower turns blue. I first used Mr. Clean bathroom eraser and it came sparking white. Only had to scrub hard on the bad spots. I then made this shower cleaner spray and have used it now for2 weeks. Blue has not come back and my walls in the shower are still sparking white. This is a great spray and I happen to love the alcohol smell I just feel it makes my shower smell really clean. 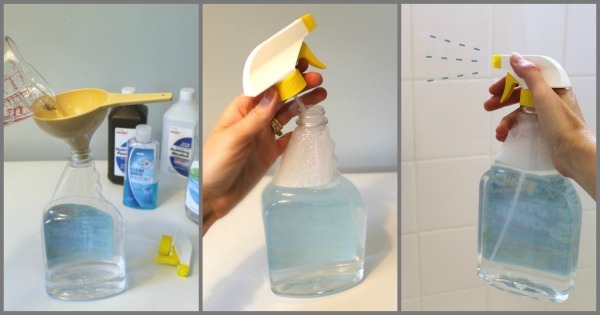 Does this homemade daily shower cleaner work on shower doors too? I can’t speak from personal experience because we have a shower curtain set-up, but I think it should work to keep the scum and water spots away on a door too. Try using this combo…1/2 cup Dawn, 1 cup Vinegar, 1 cup Finish (DW finishing rinse) fill reminder of spray bottle with water. I also add Tea tree oil for the minty scent. The key is starting with clean shower doors. Then spray them daily after showering and rinse off. Makes them sparkle! OK, a dumb question here…I made a cleaner with dawn, vinegar, H2O and tea tree oil….does it need to be rinsed off after spraying or just left on? Boomdog02 – That sounds like a cleaner mixture that needs to be wiped off after spraying it on. I don’t think it would need rinsing, but would need to be wiped. The rubbing alcohol and the rinse aid in this daily shower cleaner recipe are what make you able to spray it on with no rinsing or wiping needed, and the recipe you described sounds different than that to me. Boomdog02, that is exactly the recipe I was thinking of by the time I got to the end of the article – great minds think alike! How are you finding it, have you had to make any changes to it and is it doing a good job on your shower? Also – most importantly are you having to wipe it down? We currently squeegee the shower after use, quite frankly this is a terribly boring affair! I added 3/4 cup Finish, the dishwasher finishing rinse and it made a world of difference. I experimented by adding essential oils to give the room a nice minty spa scent…it doesn’t need to be washed/squeegeed. I just splash some water and it rinses clean. absolutely love this stuff, keeps my shower looking great, and I’m going to make a few bottles and give them to my daughter-in-laws for Christmas! I have the fiberglass tub shower combinations. Cleaned the soap scum, etc. from both showers, shower heads, curtain liners and bathtubs with half Dawn half vinegar mix. Soaked the shower heads in this mix by using a plastic bag with rubber bands around it. With some scrubbing got everything spotless. Now I use your after shower spray daily and both are still sparkling. Even use it on the curtain liners. It keeps them nice and clean. A real work saver. Love it. So glad it’s helped you Betty! Just a note, because some of the comments are indicating the desire to add vinegar to this home-cleaning formula. Hydrogen peroxide and vinegar are not a good mix. They react to make peracetic acid, a corrosive and irritating (to the lungs) chemical. And keep bleach away from all of these. Thank you! My first thought was to mix them all but I’m certainly no chemist! I’m so glad to find this tip and can’t wait to try it! We have fiberglass doors, too, and they never seem to look clean…even right after I’ve cleaned them. And love that this concoction won’t aggravate my asthma nearly as much as the foaming stuff I used does! Instead of the dishwasher rinse aid can I use a tablespoon of vinegar instead…. You probably could substitute vinegar but it might not have quite the same “sheeting” quality as a rinse aid does. It’s worth a try! Thanks for the clarification. I am going to give this a try! Are dish detergent and dish soap the same thing? Any particular brand? Any brand of liquid dish soap will work (and I updated the recipe to show it as liquid). It seems like more often the powdered stuff for dishwashers is labeled as detergents and the liquid stuff is usually labeled as soap. Debby, I use the blue Dawn liquid dish soap and it works great! I’ve been using another concoction very similar but now I will try yours. Sounds like yours just may be better with the jet dry. Of course there are chemicals – ALL of the ingredients are chemicals. To those who want to use vinegar instead of a rinse agent – it will not do the same thing because vinegar is an acid while the rinse agent affects surface tension (sheeting action). Hello. I love this idea. I spend way too much on cleaning products. My question is can I add some essential oil to this mixture. Yes, I think it would be OK to add a few drops of essential oil to this recipe (maybe 5 to 10 drops). It would still be pretty watered down so I don’t think it would cause any problems. Thank you SO much for this recipe. I have a one piece fiberglass shower/tub and used to have the grossest shower in town but now it sparkles, just from using this! Not only that, costs next to nothing to make. We made this and really liked it, however, we’re wondering if 1) You can use this on days you don’t shower, and 2) can it be used in plastic shower doors? I think you should be able to use this spray even if it’s not after a shower, however I don’t know if there would be a need for that. But if you wanted to give that a try, I don’t think it would cause any problems. I have not used this spray on plastic, but I think it would certainly be worth a try. The rinse aid in this spray would probably work on plastic too to help water spots from building up. It works great for cleaning tile counter tops and bathroom sinks. The rinse aid makes everything sparkle. It even makes the icky bathroom sink in my husbands bathroom look awesome. To clarify, my cleaner is the vinegar / water/ dish soap mixture. I use this formula and add several drops of my favorite essential oils. Peppermint, Eucalyptus, Lavendar makes the shower smell great and opens up my sinuses if I spray the warm shower immediately following my shower while I am still in the stall before I towel off. Adding essential oils is definitely an option if you want your DIY shower spray to have some fragrance. Just found your site and made this. I will let you know how it works. Thanks! I think you’ll like it Melissa! Thanks for sharing. I did not think of using Hydrogen peroxide. I have a similar mixture of 1 part water, 1 part vinegar, a few squirts of isopropyl and a few squirts of eco friendly dishwashing liquid. I put in a spray bottle and squirt to clean. I used this for cleaning the floors with a dry mop and came up very clean. Windows looked clean as. For the stubborn grit on windows, I used a paste of baking soda and dishwashing liquid. I sometimes use my vinegar and water mixture to clean my floors too Mary. I put a microfiber cloth on my swiffer, and then keep spritzing it with my homemade cleaner while I damp mop the floor. I think next time I will try adding a little rubbing alcohol and dish soap like your recipe above.